Baby Bump Alert! Kelly Rowland Is Glowing in a New Pregnancy Pic PLUS Lebron James and Wife are Having a Girl! Kelly is giving us a fairytale. 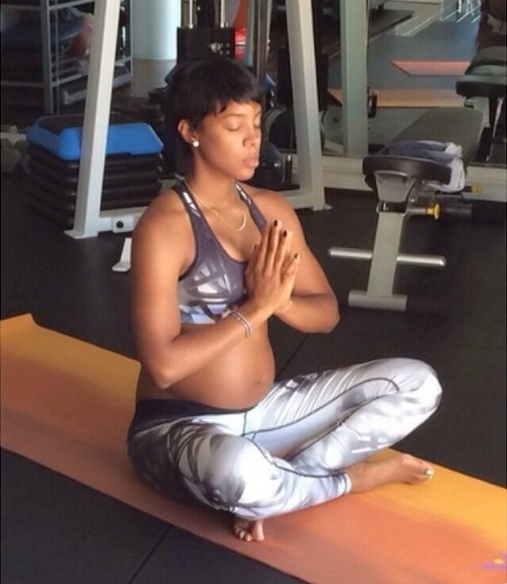 First comes love, then comes marriage and while we wait on the baby carriage we get to see the singer get her zen on with baby Witherspoon. Yesterday, Kelly revealed a peaceful shot of her doing yoga and showing off her belly just a week or so after dropping her adorable instagram bomb. While she has temporarily shelved her abs for a while, it’s clear that the new mommy-to-be intends to stay fit. Pregnancy yoga not only gives moms a chance to bond with her unborn, but also strengthens the body, releases tension from the physical stress that the body goes through as the baby grows and increases circulation to all thejoints and muscles of the body. Looking good, Mama! In other baby news, Lebron James and his wife Savannah are expecting a baby girl. While giving an interview after the Miami Heat lost the championship, President Pat Riley let the news slip that King James would be given a princess. The couple, who married last September, already have two sons, LeBron Jr. and Bryce. Looks like he’s gonna have his hands full while trying to figure out his next career move. Congratulations to both happy couples!